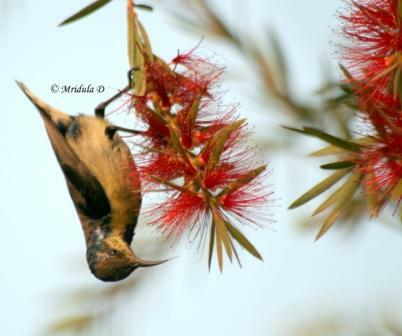 Purple Sunbird has been a constant on my bird rounds in the neighborhood. 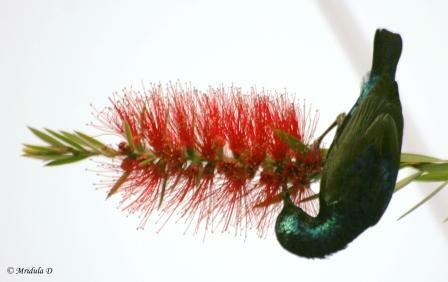 I almost always get it these days on the bottle brush trees. I am curious to see if it will become even more purple this Saturday and Sunday. It has been getting darker every week. And I am going out tomorrow, a same day trip for some personal work. So I am getting out in February too after all! 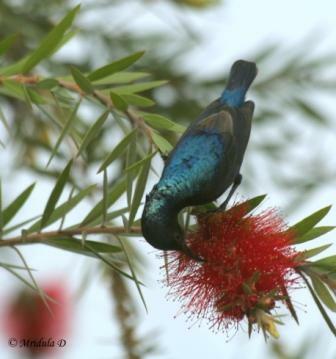 In the meanwhile enjoy more of the same Purple Sunbird. Yesterday was a good day. As soon as I started on my bird round I saw a lot of parrots making a huge racket. But they were really far away and I had no way to get closer to them. 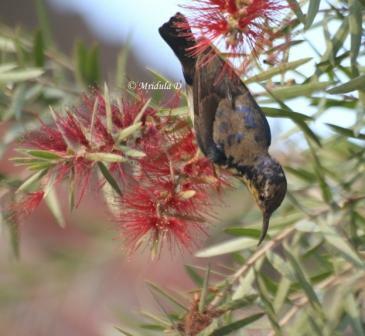 Then after a while, when I reached my bird lane, I saw this purple sunbird which remained unaware of my existence for quite sometime. 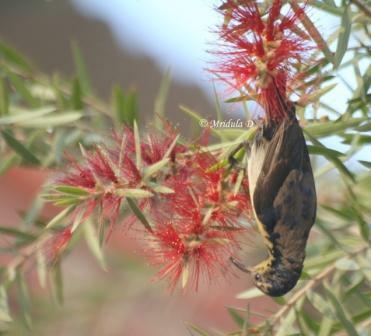 So, I managed to take around 20-25 shots before the bird decided that enough is enough and flew away. I went a little ahead and realized that the bird has come back. But when I started going closer it flew away at once. The trick was that the bird would not sit still for a long time, but thankfully it kept moving on many of the lowers that were in open view. 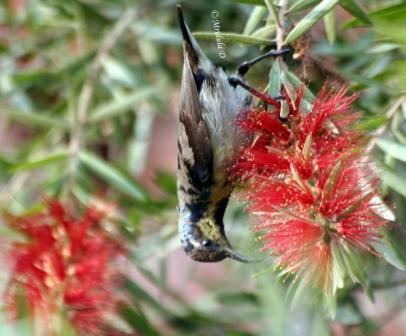 I have quit a few times waited on them when they just keep hiding on inner flowers and then fly away. I am waiting for the time when these birds don there bright purple plumage. Let us see if I then get them on red flowers. 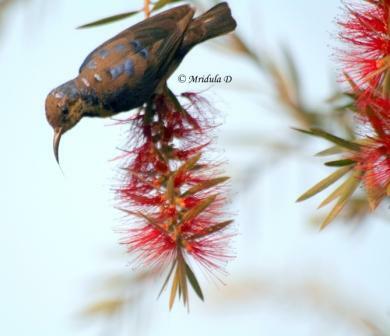 I have seen them many times on flowers in their purple plumage but never managed to click them with flowers. 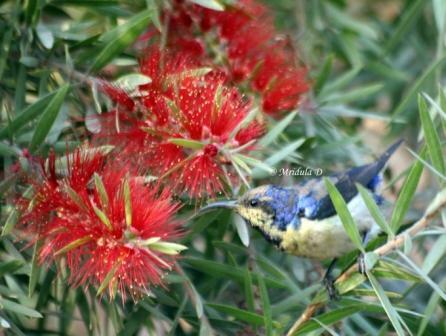 I usually do not post so many pictures because I just manage to get one shot before the bird flies away but not with this purple sunbird. Yesterday I sighted Indian Grey Hornbill but unfortunately no decent shots, it flew away before I could do much. I want to go out again today but it is so cold and grey that I am afraid to venture out. Hopefully an hour or two later the sun will struggle and come out.